OK so the leak that went out about the Stadium Series uniform is true. 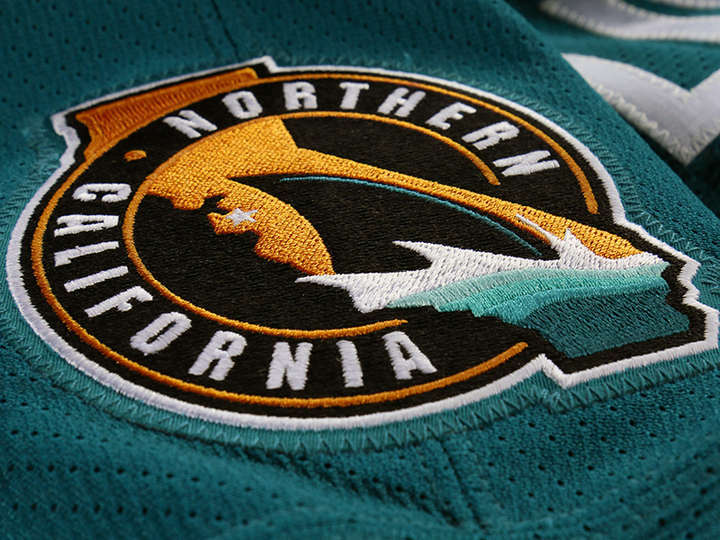 The San Jose Sharks unveiled their look and it is what we expected. Check out the slideshow above for more photos of it and check out the video here. As expected, the the top third of the jersey is teal. Then the middle portion is white. The bottom part is black. Odd but unique. The entire back of the jersey is teal, which gives this jersey a very unique and similar look to the Sabres’ thirds. What really strikes me is the huge numbers on the sleeves. But I suppose the Stadium Series jerseys are all about the in your face look. The chest logo isn’t chrome like last year, but it still looks reflective. I bet it’s going to look fantastic under the outdoor lights. What really stands out to me, and what everyone will be talking about, is the shoulder patch. On one side is the Stadium Series logo. But on the other shoulder is this beauty. As a native of Northern California who currently lives in Southern California, I can tell you that the “rivalry” is real. I love NorCal forever and this really captures the separation between the two. I can’t believe they did this but I am so glad they did. In fact, this is the main reason why now I want to buy this jersey. They even have a star on the state where San Jose is located. The orange collar trim is fine and the team slogan that nobody will see is just there. There is no lace in the front of the neckline. This design kind of works with the streamline appearance of the jersey. It’s not a great jersey in terms of aesthetics, but it’s unique and different and I like that. The Kings are expected to unveil theirs soon and the design template is the same. Still, the Sharks have a good one-time jersey and I am excited for it. I will be at the game. What do you think of this jersey? This entry was posted in Los Angeles Kings, New Sets, NHL, San Jose Sharks, Stadium Series, Uniforms & Design and tagged Reebok. Bookmark the permalink. ← Did the NBA go too far with color vs color last night?